Fiction – paperback; Serpent’s Tail; 155 pages; 1999. Translated from the French by Paul Hammond. 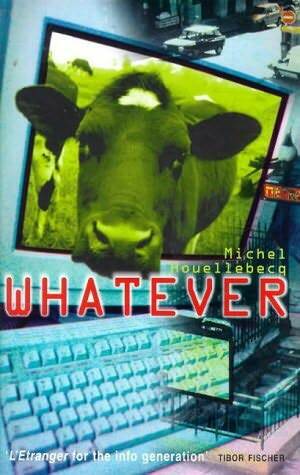 I bought Whatever on the strength of Michel Hoeullebecq‘s (pronounced Wellbeck) very brilliant Atomised. Unfortunately, it did not live up to expectations. I’m not even sure what this book was about. The narrator, a sad, depressed 30-year-old computer nerd, spent most of his time in an agitated state of boredom. I had no sympathy for him at all. If Houellebecq was trying to make some kind of statement about modern day life, it was either too subtle for me to grasp or too profound for me to identify. His dejected cast of characters, drifting through life with no sense of purpose, were so emotionally detached from everything around them that I found myself just as emotionally detached reading about their exploits. Despite this, the book does offer small glimmers of Houellebecq’s genius which comes to the fore in his following novel, Atomised.